This is what people want to see when going to a Hot Air Balloon Festival! 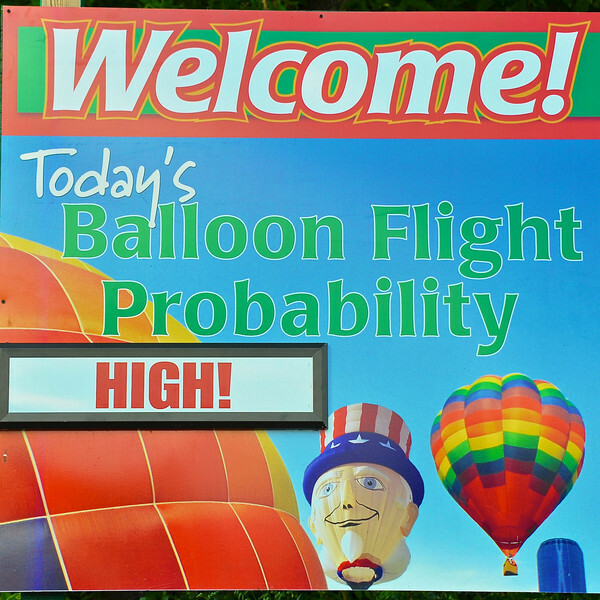 It has been a couple of years since I have seen this sign set to HIGH at the Syracuse Balloonfest. Sure brought a smile to my face! The Syracuse Balloonfest had a perfect start on Friday, June 10, 2011. Light winds, evening sunshine and cooling temperatures lead to dozens of colorful hot air balloons launching to the 5th Dimension’s classic, “Up, Up and Away”. 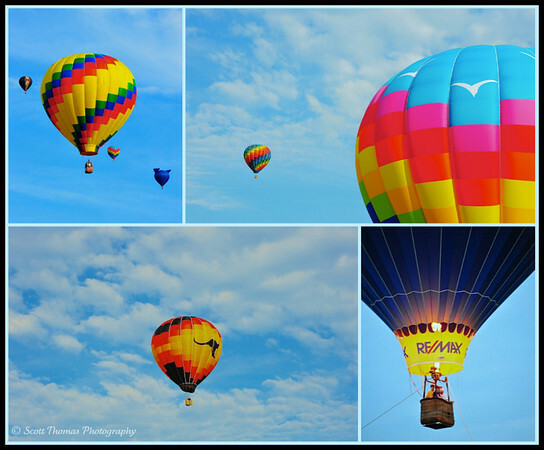 This entry was posted in Event and tagged 28-300mm, balloonfest, blue, collage, colors, hot air balloon, new york, nikon D700, sky, syracuse, vr. Bookmark the permalink. Our local ballon festival is sometime in September, and I’m hoping we make it back there this year. We went several years ago and never did see the balloons take off because the launch was cancelled for some reason. They cancel launching quite often if there is a hint of inclement weather. This was the first launch I have seen in a couple of years. I like that they have this sign up before you pay the entrance fee. There is lots more to see and do besides seeing the balloons but it is nice to know. Love the colors against the partly cloudy sky. Nice work with the collage, did you use Photoshop? Thanks, Mike…I use an online editor called Picnik.com for my collages. I do not own PS and do all of my photo editing and management in Apple Aperture 3 with the help of a couple of plugins. Chance of flight was only Fair when I was there! I love the blue skies you captured – much better than the gray gray gray that was there on Sunday night. Gray skies are hard but you got some “moody” images from the balloonfest. Hot air balloons are magical and I hope to one day enjoy a ride on one! We don’t really have any festivals that close to us. I wish we did. Every once in a great while, we see a solitary balloon in our skies. No idea why. The upper right photo is my favorite. This looks like a great event for photo taking. Must have been a ton of fun. Do you think you will ever present us with photos taken FROM a hot air balloon? I never say never but it is a tad on the expensive side to take a ride in one of the balloons. I would use the UWA lens looking up, down and all around. Those baskets are not very big. Our is in October, I hope to be able to attend this year. The sky is beautiful, did you have to use any filter? No filter was needed with the low Sun angle and by keeping the Sun either to my back or side. I did add a dash of vibrancy in my processing to bring out the sky and clouds more. We can see in one of your picture our balloon named Piko in the sky! We are coming to the Syracuse Balloon Festival since 3 years and each time, we have a great time with festival goers! Thank you so much for welcoming Canadian neighbours!